Something I Should Have Done Long Ago… and More! Okay! I have wonderful news! However, to understand this news, I need to do what I should have done a while back. Civil Air Patrol, or CAP (pronounced either C-A-P or Cap as in ball CAP) as it is more commonly known, is an organization founded in December 1942, days before an attack on Pearl Harbor brought the US into World War II. It has grown and developed into the organization it is today, with three main missions. Emergency Services – We can get called out to look for missing persons or downed aircraft, or to help with natural disaster relief. Aerospace Education – We help educate the public on the history and lasted advances of aerospace. At the same time, we cadets (and the senior members as well) learn about it ourselves. Cadet Programs– this is my favorite! It’s for anyone ages 12 – 18 who is interested in gaining more leadership experience and having fun in after-school type activities like Color guard or drill team. My news is connected with cadet programs, so now I shall expand on it a bit. Cadet programs is broken into 4 leadership phases during which cadets learn different skills based on their current rank and phase. It is similar to the Air Force’s chain of command. In this phase the focus is to train the cadet in how to be a follower. They are introduced to the core values of CAP and how to be the best cadet they can be. The last phase taught how to follow, and look to your leaders. This phase transitions from being a follower learning to lead, to a leader who knows how to follow. Basically in this phase you are actually taking on minor leadership roles in which to practice the skills you were learning in phase one. This phase takes what you learned in phase two and kicks it up a notch. This involves higher leadership roles, more people to work with, and more opportunities to practice everything you’re learning. Okay, this is a little bit of a mystery phase to me, as my old squadron didn’t currently have anybody above the rank C/Capt during my time there… from what I understand, it’s the transition phase from the cadet program to senior program. The cadets who reach this rank are typically older cadets who are almost or already a college student. This marks the last years of their time as a cadet. It means more leadership, more work, and I believe (or at least hope… ) greater rewards through life. Okay! 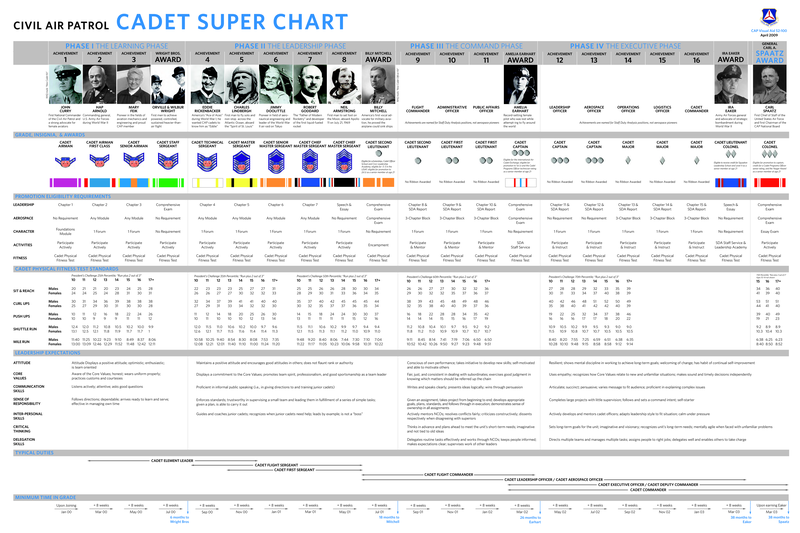 I would now like to direct you attention to the Cadet Super Chart that is hopefully readable near the top. Looked at it? Okay, good. What you should have noticed is the majority of the achievements are named for great pioneers in aerospace. I love that about the cadet programs, and so does my former squadron commander. Every time someone would promote (earn a new rank in the cadet program) he’d quiz them on what achievement (i.e. Curry, Fiek, Lindbergh…) they’ve just earned, and what that person did. It is my absolute favorite part of promoting. Now, there are eight achievements that are not named for great aviation pioneers and heroes. Those would be 9 – 16. They have been unnamed since the founding of the cadet program. CAP nationals is finally looking at naming them. The eight nominees for the unnamed achievements could not be more worthy, and I was actually naming one of them as deserving the achievement before I even knew they were going to name them! First African American 4 star general of the Air Force. First female pilot in the United States Air Force Air demonstration squadron. Better known as the Thunderbirds. First USAF female fighter pilot. First African American women to be a licensed airplane pilot. Elwood Quesada was a member of the famous Question Mark endurance crew of 1929. Quesada was also the first administrator of the Federal Aviation Administration (FAA). Was commander of the US Air Force in Europe during WW II, during which time he planned air raids over Japan and the Berlin airlift. He helped form Strategic Air Command, or SAC, and assumed command of the newly formed SAC in 1948 where he laid plans for the ICBM (Intercontinental Ballistic Missile). Helped design over 40 of the world’s top aircraft including the U-2 and the SR-71 “Blackbird”. Now, we are not sure if all eight primary nominees will be approved, they may pull some of the alternate nominees to be used. However, what I am hopeful is that there won’t be a big bureaucratic discussion on it so that those eight achievements can be named, and us cadets can have the fun of rattling off bios every time we promote. Civil Air Patrol is really an amazing organization, and I love being a part of it. You can do so much, from being a flight commander, to teaching kids how to make paper rockets at an air show. You learn Air force style drill (marching, column movements, things like that) and compete against and meet cadets from all over the US, and sometimes over seas! There are camps, and special national level activities you can participate in. You don’t have to love the military life, or want to be a fighter pilot. True. most cadets you meet have that life in mind, but not all. The older brother of one of my old… friends? Acquaintances?… anyway, her brother was the former Cadet Commander of my former squadron. He got accepted to both the Air Force Academy and West Point, but instead went to a nearby Catholic college to study to be a priest. So you see, it has it’s benefits for those who are considering a military career, but it’s also just a fun group to join. My brother’s in the English version. He certainly thinks so, and parades about the house in full camo gear half the time. I’m sorry, I got stuck yesterday, and yes, I was also behind reading on your posts. I’m sorry. Real life… interfered.